How Does Cold Weather Affect My Garage Door? / Comments Off on How Does Cold Weather Affect My Garage Door? Because your garage door is the largest mechanical object in your home, you want to keep it running safely and smoothly, 365 days a year. Faulty garage doors can cause injury and damage to your home, so maintenance, especially during extreme weather changes, is essential. But what affect does this weather really have on your home? Winter here in Oregon and Washington brings rain. Lots of it. If your door is made of wood, increased moisture can cause it and the surrounding framing to swell. If the door and the frame swell, the clearance between the two decreases and can cause the door to rub against the frame or even become stuck in place. 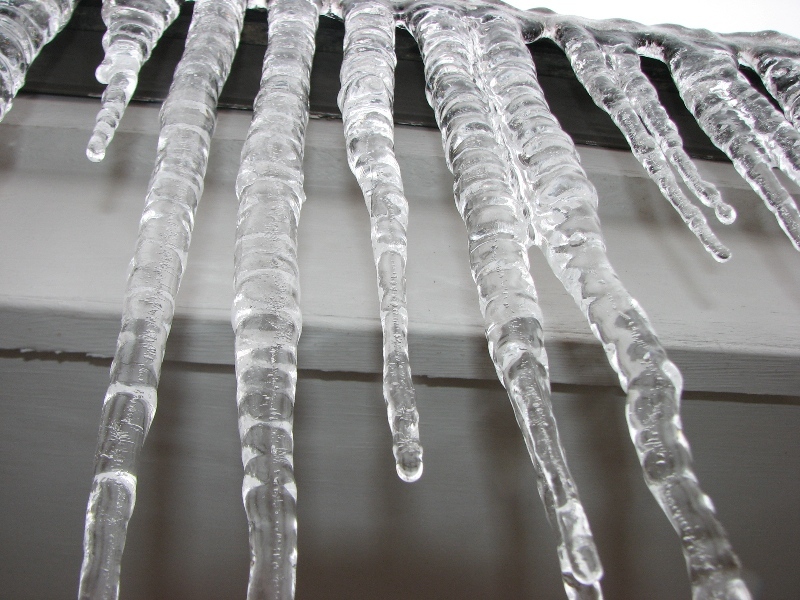 In the event of freezing weather, your door can freeze shut if there is any water pooling at the bottom. If this occurs, the only method of releasing the door is melting the ice, so you are in a much better position if you prevent the water from pooling. Garage door openers are particularly susceptible to weather change. The moving parts enclosed in garage door openers operate best when lubricated with various products, all of which can change consistency when weather changes. In addition, the opener’s sensitivity, which allows it to stop and reverse if it hits an object en route. However, if the sensitivity level on your opener is programmed to “light,” the motor may interpret thickened lubricant as the door hitting an object, which may halt the garage door or cause it to rise up. If your door is getting stuck or reversing direction this season, contact Ponderosa Garage Doors to help diagnose the problem and come up with an actionable solution. Our years of expertise and exceptional work ethic will help to put your mind at ease, resolving long-standing issues. Winter is an extreme season. Freezing temperatures and increased precipitation can wreak havoc on many areas of your home, including your garage door. For this reason, our team at Ponderosa Garage Doors and Repair are happy to help with any and all repairs, as well as regular maintenance. In addition, our guide to resolving garage door issues before winter can help you look for discover what you need to do to prepare your home to sustain adverse weather conditions.